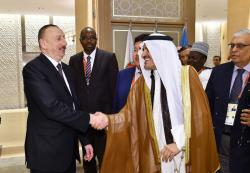 Azerbaijan has made history by successfully hosting another high-profile international sporting event – the 4th Islamic Solidarity Games. 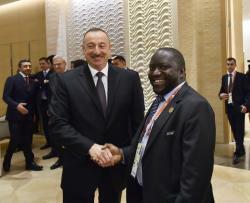 Baku experienced a thrilling 10 days of sport and solidarity. 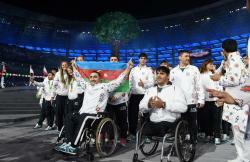 With a haul of 75 medals, Azerbaijan topped the overall medal table of the Games. 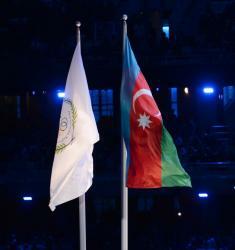 Azerbaijan`s state anthem was played 75 times, the country`s national flag was raised 162 times throughout this multi-sport event. 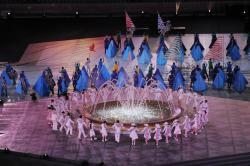 The 4th Islamic Solidarity Games came to a close with a stunning Closing Ceremony at Baku Olympic Stadium. 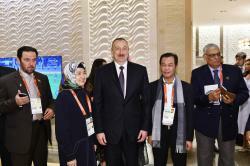 The stadium welcomed officials and guests – President Ilham Aliyev, First Vice President and Chair of the Baku 2017 Organising Committee Mehriban Aliyeva, Secretary General of the Islamic Solidarity Sports Federation (ISSF) Faisal Abdulaziz Al-Nassar, Azertac reported. The stadium has been transformed into an enormous 360˚ performance and concert space equipped with a state-of-the-art sound system. 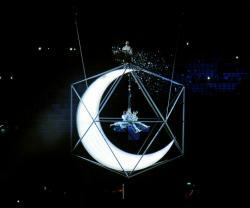 The stage elements were laid on a grid that referenced the extraordinary geometric designs characteristic of Islamic art, and traditional Azerbaijani carpets. 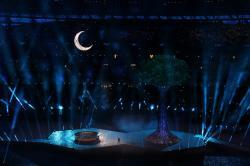 Centre stage was a large water bowl made of polished and hammered copper, 8m in diameter (which appeared in the Opening Ceremony on 12 May), and a tree of life, 25m high. 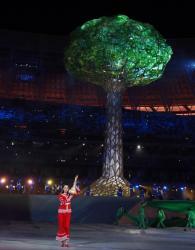 The set was installed in just 36 hours, following the end of the Athletics events on 20 May. 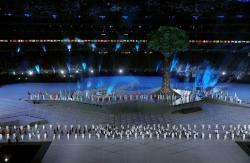 The Ceremony was brought to life by 1,500 volunteer performers from Azerbaijan. 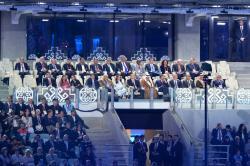 More than 5,000 people from 31 different countries have helped make the Baku 2017 Ceremonies a reality, including production staff, technical crew and cast. 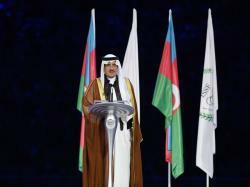 Hailing the organization of the Games, Prince Abdullah Bin Mosaad Bin Abdulaziz, President of the Islamic Solidarity Sports Federation, said: "This evening's Closing Ceremony marks the end of a wonderful festival of sport and friendship here in Azerbaijan's capital. 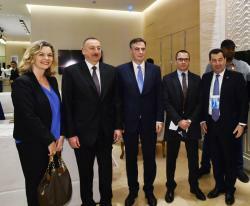 Baku has provided the perfect setting for the athletes of our nations to shine, and for people from four continents to celebrate our shared bonds in a spirit of unity and understanding." 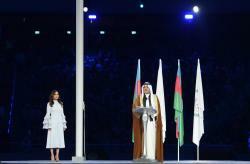 "These memorable Islamic Solidarity Games were made possible by our gracious hosts, under the leadership of the President of the Republic of Azerbaijan, Ilham Aliyev, and through the commitment of First Vice President of the Republic of Azerbaijan and Chair of the Baku 2017 Organising Committee, Mehriban Aliyeva and all her team at AISGOC. 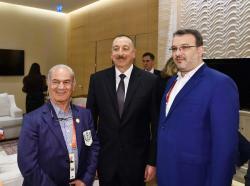 On behalf of the Islamic Solidarity Sports Federation, I would like to thank the people of Baku and Azerbaijan for their dedication and countless acts of generosity throughout. 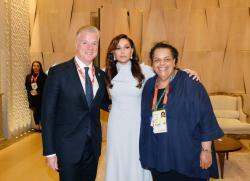 We look forward to meeting again at the 2021 Games in Istanbul." 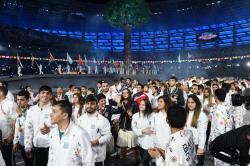 Azad Rahimov, Minister of Youth and Sport of the Republic of Azerbaijan, Chief Executive Officer of Azerbaijan Islamic Solidarity Games Operations Committee, said the Closing Ceremony of the Baku 2017 Islamic Solidarity Games marks the end of a thrilling 10 days of sport, celebration and friendship. 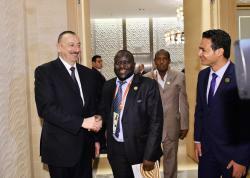 "Building on the legacy of the Baku 2015 European Games, we have welcomed old friends and new from across the Islamic world to our state-of-the-art sporting facilities, and our young people have applied their ever-growing skills to deliver yet another world-class event. The work of the Baku 2017 Operations Committee may be coming to an end, but our capital city's journey as a world centre for international sport and culture goes on. 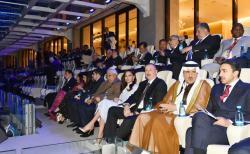 "Sport will continue to play a central role in our national development in the years to come. 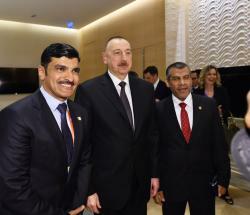 We look forward to welcoming the world again to Baku for the Formula 1 Azerbaijan Grand Prix this summer, the 2017 Women's European Volleyball Championships, and for three group stage football matches and a quarter-final of the UEFA Euro 2020 Championship." 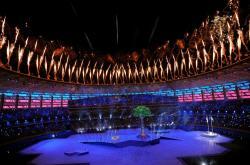 In July 2013, Baku was announced as the host city for the fourth Islamic Solidarity Games – an exciting multi-sport event uniting the Islamic world. Athletes from more than 50 Islamic countries came together from 12 to 22 May 2017 to represent their nations over 10 days of competition across 20 different sports. They included 24 disciplines (Athletics and Para Athletics, Aquatics: Diving, Aquatics: Swimming, Aquatics: Water Polo, Basketball 3x3, Boxing, Football, Gymnastics: Artistic, Gymnastics: Rhythmic, Handball, Judo and Blind Judo, Karate, Shooting, Table Tennis, Taekwondo, Tennis, Volleyball, Weightlifting, Wrestling: Greco-Roman, Wrestling: Freestyle, Wushu and Zurkhaneh) in 16 state-of-the-art competition venues across Baku. 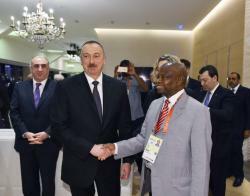 The Azerbaijani capital hosted a record number of more than 3,000 athletes, around 2,000 team officials and technical staff. 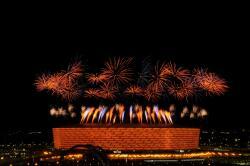 Baku 2017 enjoyed a global audience of more than one billion in over 50 countries. 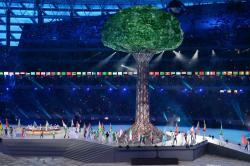 The Games were covered by more than 1,000 media representatives. 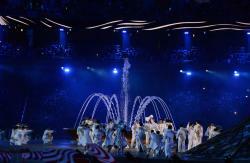 A total of 2,800 athletes from four continents contested 1,585 medals in 269 medal events. 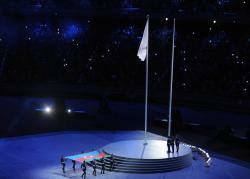 Azerbaijan topped the medal table of the Games with 161 medals, including 75 golds, 50 silvers and 36 bronzes. The largest number of medals came from judo fighters, who claimed 11 golds, 12 silvers and three bronzes. 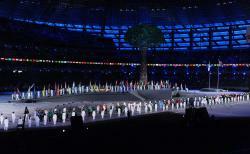 Turkey finished second with 194 medals and Iran ranked third with 97 medals. 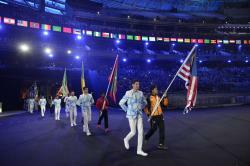 Uzbekistan and Bahrain finished fourth and fifth with 63 and 21 medals respectively. 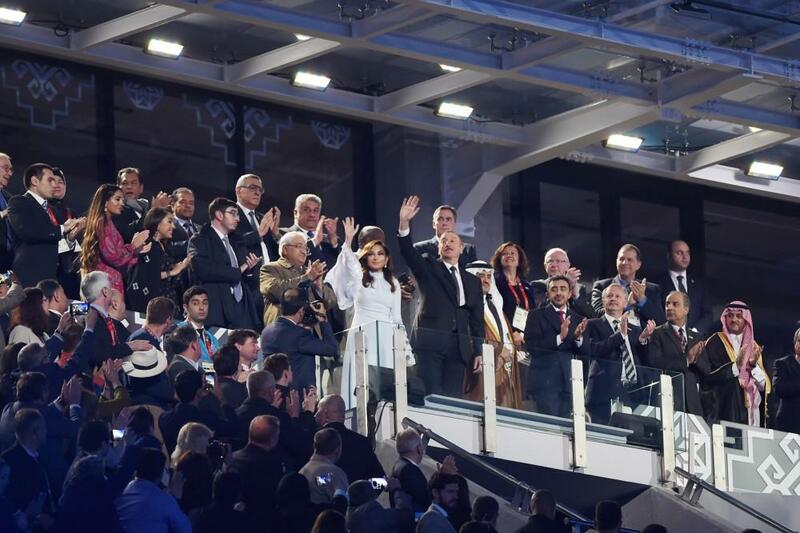 President Ilham Aliyev and first lady Mehriban Aliyeva personally watched several competitions at venues and presented medals to winning athletes, which increased interest in the Games. 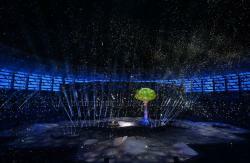 In a video that played on the Stadium screens, gold dust was carried by the breeze of the Gilavar across Azerbaijan. A young woman in Baku's Old City blew gold dust into the air and the Gilavar breeze carried it across Azerbaijan, opening door after door in tribute to the country's renowned hospitality and kindness. Screens featured many natural and architectural treasures of Azerbaijan – the Palace of Sheki Khans, Gobustan National Park, Shirvanshah's Palace, Maiden Tower and the Heydar Aliyev Centre – before heading to the Baku Olympic Stadium. 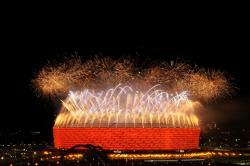 The stadium counted down from 10 to one to start the Baku 2017 Islamic Solidarity Games Closing Ceremony. 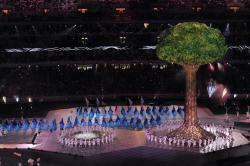 1,500 volunteers performed in the Ceremony. The flag of Azerbaijan was carried by eight and raised by three servicemen of the National Guard of the Special State Protection Service. It was then raised as the national anthem plays. 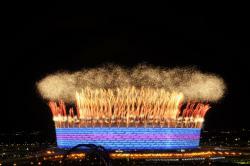 Fireworks shot from the Stadium roof in the national colours of Azerbaijan. 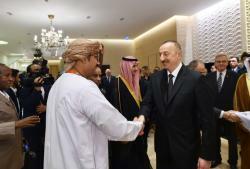 The Closing Ceremony celebrated all athletes and their great achievements over the past 10 days in Azerbaijan, where the Islamic world has come together in the spirit of peace. 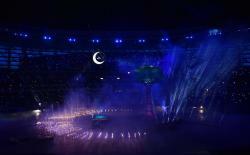 Tonight the athletes of the Islamic World entered the Stadium as one. 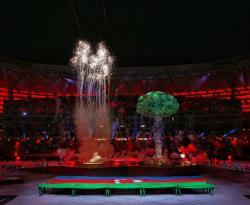 The host nation Azerbaijan, concluded the Parade. 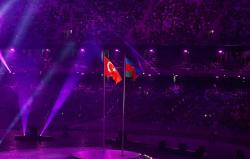 The stadium gave Team Azerbaijan a standing ovation as local athletes shined at these Games. 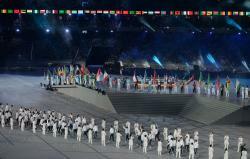 Apart from Azerbaijan, the fourth edition of the Islamic Solidarity Games featured teams from Afghanistan, Albania, Algeria, Bahrain, Bangladesh, Benin, Brunei Darussalam, Burkina Faso, Cameroon, Chad, Comoros, Côte d'Ivoire, Djibouti, Egypt, Gabon, Gambia, Guinea, Guinea-Bissau, Guyana, Indonesia, Iran, Iraq, Jordan, Kazakhstan, Kyrgyzstan, Lebanon, Malaysia, Maldives, Mali, Mauritania, Morocco, Mozambique, Niger, Nigeria, Oman, Pakistan, Palestine, Qatar, Saudi Arabia, Senegal, Sierra Leone, Somalia, Suriname, Syria, Tajikistan, Togo, Tunisia, Turkey, Turkmenistan Uganda, United Arab Emirates, Uzbekistan, Yemen. Then creative began. 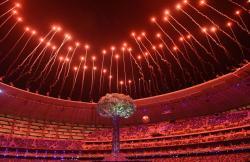 The Baku 2017 Closing Ceremony was rooted in the elemental landscapes of Azerbaijan. 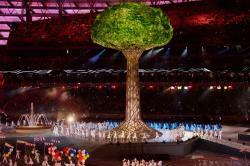 The tree of life, standing proud, was watered and grew. The mountains, forests and rivers of this glorious land were created before our eyes. 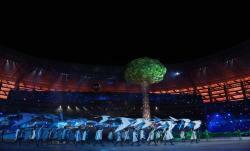 Cast carried 60 silks (each measuring 7 x 1.35m) in three colours – green, brown and blue. As birds flew overhead, the silks came together to create a beautiful landscape. 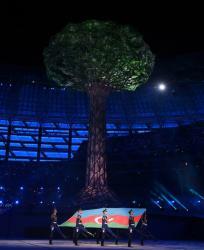 Green represented the forests, brown the mountains, and blue the rivers of Azerbaijan. 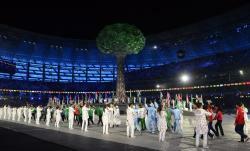 The silks were flipped to reveal the flag of the Republic of Azerbaijan. Sporting highlights of the past 10 days were shown on the Stadium screens, highlighting moments of incredible skill, courage and joy. The highs and lows of competition. And the friendships forged along the way. 'Hour of the Wolf' by Elnur – Azerbaijan's entry for the Eurovision Song Contest 2015 played. The sun rose to reveal the bright colours and intricate patterns of shebeke stained glass – a traditional art form of Azerbaijan. The glass transformed into the crystal waters of the Caspian Sea, sparkling in the setting sun. 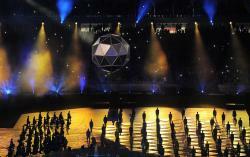 More than 1,000 colourful triangles, hinged together in flip books, were arranged in two large hexagons. Their pages were turned by 110 peformers to create a series of intricate patterns inspired by shebeke glass. As the sun set, the flip books were turned to reveal blues, and raised to create a rippling 3D representation of the Caspian Sea. 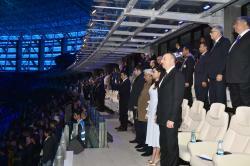 454 cast performed on stage as Traditional Azerbaijani song 'Karabakh Shikestesi' was played. 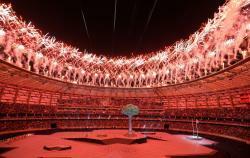 The stadium saw light-hearted scenes of daily life on the Baku Boulevard. Some people played with kites and balloons, others played chess or had newspapers blown from their hands. Objects that come to life in the wind – such as wind turbines and windsocks – were brought on stage. 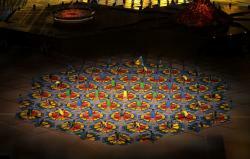 All the props and costumes were decorated with wavy patterns representing the Gilavar. As the cast danced Yalli, the clouds were released. 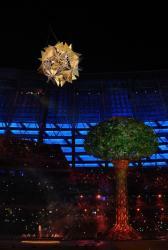 More than 1,000 balloons, and thousands of leaves from the tree of life were carried by the Gilavar into the night sky. 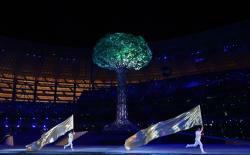 457 volunteers performed in this scene as Gulara Aliyeva's 'Fantasia on Shur Mugham' was played. The luminous crescent moon rose, and moved over the stage. The cast form hands holding a globe, and a dove. The dove, a symbol of peace, was woven into cultures all around the world. The cast then created buta shapes – an ancient almond-shaped design symbolising fire, found on Azerbaijani decorative artworks and architecture. Projections on the floor matched the cast's formations. 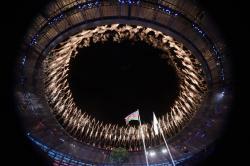 Finally, as the crescent moon moved over the centre of the Stadium, the cast ignited more than 750 hand-held flares to create a crescent. It embraced the water bowl, which became a beautiful fountain. 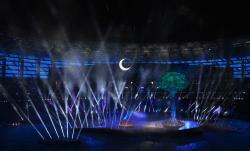 As the water rose, sparkling confetti fell from the moon and pyrotechnics shot from the Stadium roof. 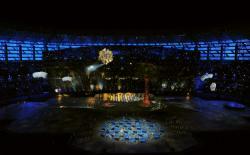 'Karabakh' (Qarabağ) by Natig Shirinov played as 384 volunteers performed in this scene. 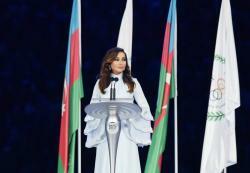 First Vice-President of the Republic of Azerbaijan, Chair of the Baku 2017 Organising Committee Mehriban Aliyeva was invited to the stage to deliver a speech. 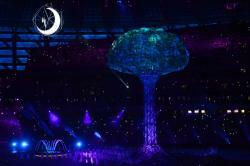 "Over the past 10 days, athletes from across the Islamic world came together in an inspirational celebration of sport, friendship and unity. Their courage and dedication was truly moving, their performances thrilling to watch." 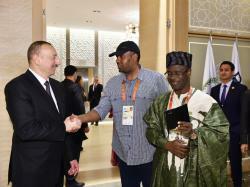 "I would like to thank the Islamic Solidarity Sports Federation for the opportunity to welcome the athletes of the Islamic world to Baku, strengthening the bonds of solidarity among our peoples." "I am delighted to announce that the next Islamic Solidarity Games will be held in Istanbul in 2021. 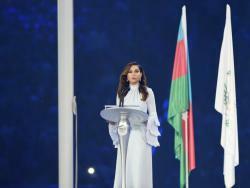 We wish our Turkish brothers and sisters every success," said Mehriban Aliyeva. 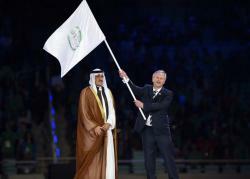 Secretary General of the Islamic Solidarity Sports Federation Faisal Abdulaziz Al Nassar made a speech. 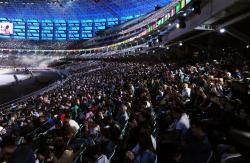 "This evening's Closing Ceremony marks the end of a wonderful festival of sport and friendship here in Azerbaijan's capital. 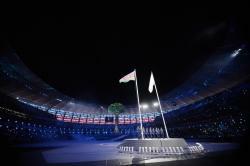 Baku has provided the perfect setting for the athletes of our nations to shine, and for people from four continents to celebrate our shared bonds in a spirit of unity and understanding." 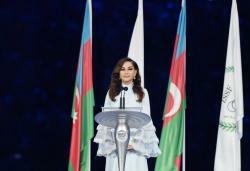 "These memorable Islamic Solidarity Games were made possible by our gracious hosts, under the leadership of the President of the Republic of Azerbaijan, Ilham Aliyev, and through the commitment of First Vice President of the Republic of Azerbaijan and Chair of the Baku 2017 Organising Committee, Mehriban Aliyeva and all her team at AISGOC." 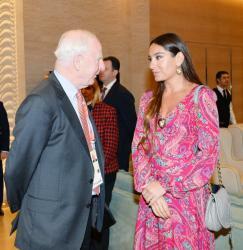 "I look forward to us all joining together again in four year's time to celebrate the Games of Istanbul 2021," he said. 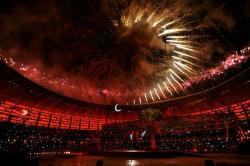 A video played on the Stadium screens welcoming the world to Istanbul, host city of the fifth Islamic Solidarity Games in 2021. Three servicemen of the National Guard of the Special State Protection Service lower the ISSF flag. They passed it to eight more servicemen who carry it out of the Stadium. 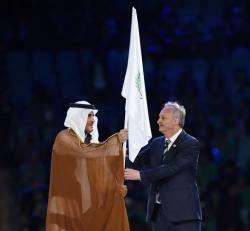 The Secretary General of the Islamic Solidarity Sports Federation, Faisal Abdulaziz Al Nassar, handed the flag to the Deputy Undersecretary of the Ministry of Youth and Sport of the Republic of Turkey, Kamuran Ozden, representative of the Istanbul 2021 Islamic Solidarity Games. As the national anthem of Turkey plays, their flag is raised by three servicemen of the National Guard of the Special State Protection Service. Then Unity Concert began. Samra Rahimli, Nigar Jamal, Miri Yusif, Sabina Babayeva, and Eldar performed on the main and side stages. 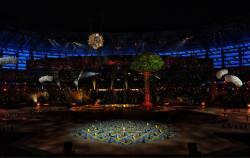 Colourful floor projections animate the stage. Tunzala Aghayeva sang the 2017 Azerbaijan Grand Prix Song – 'Speed' – from the side stage as 30 cast with light sticks performed on the main stage in tribute to the Baku City Circuit. 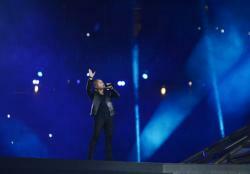 She then closed the Unity Concert with two songs from the main stage – the Baku 2017 volunteers' anthem 'Hello Baku', and 'I am Azerbaijani'. 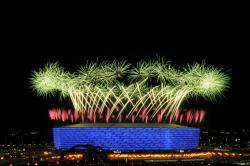 The concert ended with a spectacular firework display over the Stadium.